Natto is often considered to be the most unique and strange food experience when it comes to introducing Japanese cuisine to foreigners. It's stinky, sticky, and reminds you of mucous. While as a singular food, natto may indeed be one of the strangest things you can eat in Japan, there is a class of food that I discovered is a bit bigger and more broadly used than what I regard as its nearest Western cousin. That is a group of foods that, after processing, are fairly flavorless. My first experience with this came when I mentioned to a student that the chanko nabe (a sort of sumo wrestler's stew) that I'd had on my tour of a sumo stable had these weird little grey blocks with black specks in them that found distasteful in appearance. The student practically gushed about how wonderful konnyaku was and how much she loved it. She said it tasted so good and was really healthy. I told her I didn't eaten these little somewhat gelatinous blocks because the reminded me of frog's eggs and asked what they tasted like. She paused and said, "They don't taste like anything." Such was my experience in Japan with certain foods. People would tell me something was fantastic, but it didn't taste like much of anything. That included jiggly blocks of pale tofu, konnyaku, and mochi. While we have bland foods in the U.S. (potatoes, rice), we don't have foods that are processed and end up flavorless with the exception of gelatin... at least not that I can think of. And, even if we do have such foods, we lack the same level of enthusiasm that I saw for them in Japan. Most of these foods are about their texture as well as the flavors that they can absorb from other ingredients. It took me awhile to come around to enjoying such foods, but it helps that I'm a texture junky. Mochi in particular is very much about how it stretches and the sort of chewy, softness it offers. Fresh mochi is amazing. Stale stuff is inedible. 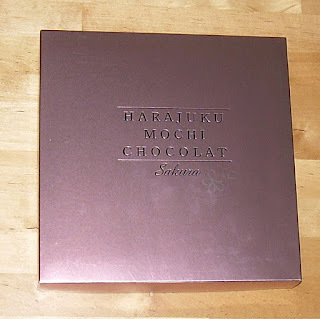 When you order shelf-stable sweets like this Harajuku Mochi Chocolate, there is always a risk that it'll be tough as you don't know how long it has been sitting around or how well it is packed. I'm pleased to say that this much have industrial strength oxygen absorber packets and is sealed well. The mochi comes in a square box with a little plastic two-pronged fork so you can stab the hands of people who try to eat your delicious, delicious mochi without piercing the skin and risking a lawsuit. Though there are ample numbers of pieces, they are quite small. Each is a little bigger than a quarter and fairly thin as mochi goes. The "chocolate" is a soft, creamy white substance that runs thinly through the center. When you eat it, it imparts sweetness, but there is too little to get a good sense of flavor or creaminess. 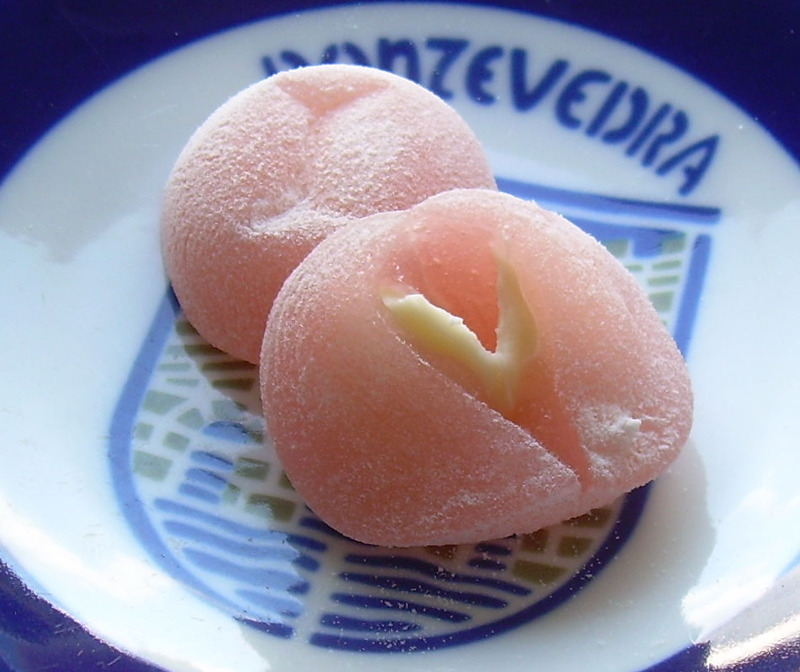 Each bit of mochi is a soft little pillow that is somewhat chewy, but easy to bite into. 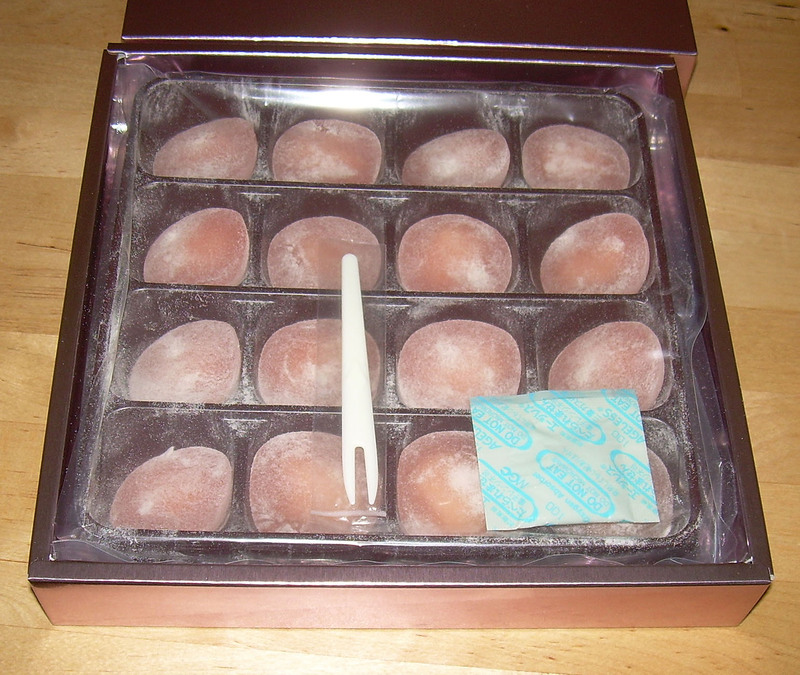 Even after I'd opened the package and consumed the mochi over several weeks, they remained fresh to the last morsel. The first hit on your tongue is sweetness, perhaps from the coating which could be cornstarch mixed with powdered sugar. It could also just be that the filling is spread evenly enough and is sweet enough to leave a lasting impression. The second bite is more floral and yields more cherry notes. On the back-end of a tasting, it can even leave a whisper of herb-like and slightly medicinal flavor, but not in a negative way. As mochi goes, this is fairly flavorful, sweet without being cloying. Of course, mochi often lacks a very strong flavor so saying it is "flavorful" isn't meant to convey that it's a flavor-blasted experience, but just that it is present. In terms of how I liked this, I liked them very well and was happy to have tried them. That being said, I mainly chose these because it is spring and sakura is a seasonal flavor that won't be around in several months. I likely would not buy them again as I regard this more as a curiosity purchase than a standard snack that I'd like to have again. 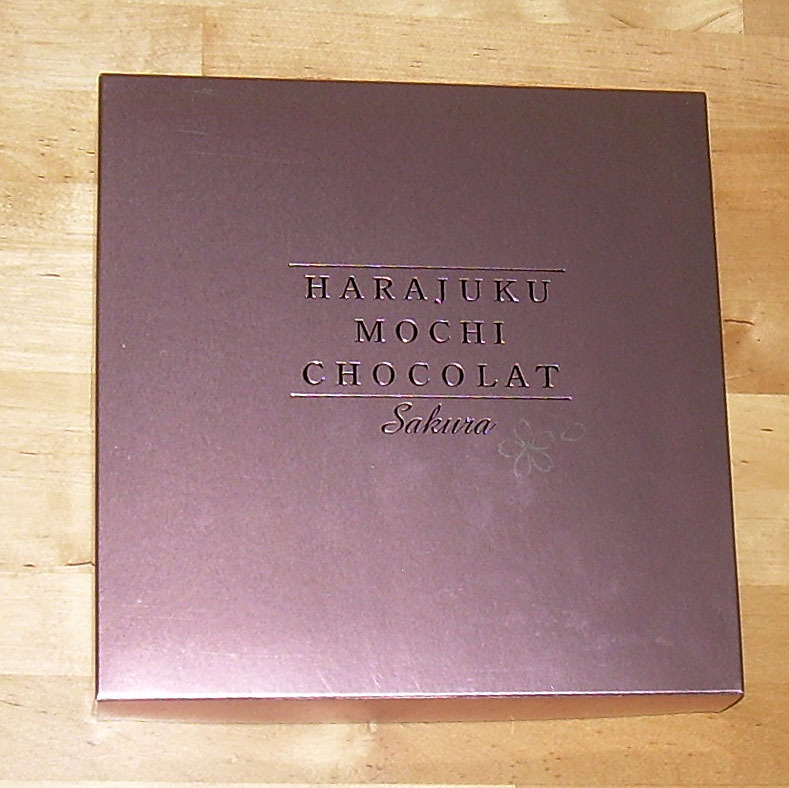 If you enjoy sakura's cherry and floral notes, then you likely will enjoy this more than me (and I did enjoy them). If not, you may want to try a flavor more akin to your tastes like chocolate or green tea.